Did Gotham Tease the Court of Owls In Episode 2? During the second episode of Gotham's second season, we think we might have caught a glimpse of...well, an owl's eyes. Spoilers ahead for last night's episode of Gotham. When Tabitha Galavan fires off her sniper rifle and takes out Dobkins, she breaks the rifle back down and puts it into a wooden case to make her escape. 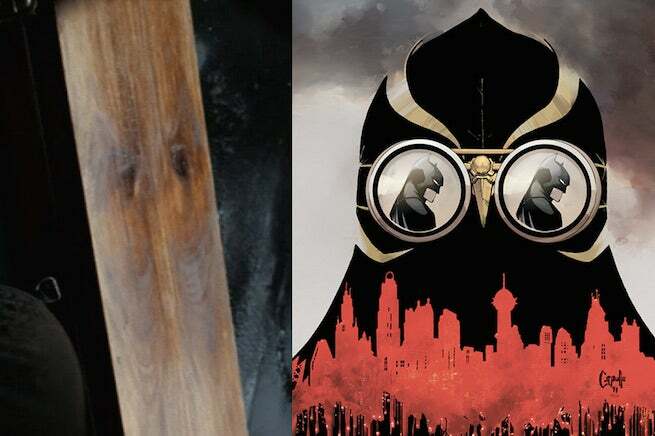 As you can see above, there's a fair amount of similarity between the mask of Talon, the assassin of the Court of Owls, and the design in the wood grain of her rifle case. Is that a coincidence? Are we just seeing things because we want to? It's hard to say. ComicBook.com has reached out to FOX for a comment, so if we hear anything we'll let you know. But it's tempting to read into it, considering that it's just a week since Gotham showrunner Bruno Heller confirmed for us that the Court of Owls will play a role in the series...eventually. What do you think, readers? Is that enough to convince you that the Galavans are playing a role in the Court of Owls? Certainly, the whole weird "costumed nutball" thing from the season premiere gave a lot of people the idea...!